Here is a shot taken yesterday’s morning. These expressive guests are members of a drama group, “gekidan eisei” from Kyoto. Their stay in wakabaya was the “biggest” with many people and long stay, since our open last July. 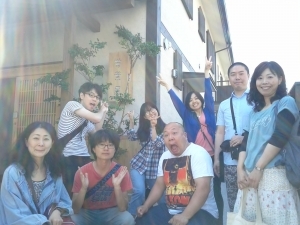 They stayed in Takamatsu and wakabaya for playing a drama, whose story is about Japanese traditional tea ceremony. And their drama was performed in a teahouse, Takamatsu. It is very fun for me to meet and talk with people with really various specialties. Gekidan eisei, thank you very much and see you on your next performance in Takamatsu!